Be the first to share your favorite memory, photo or story of Sharon. This memorial page is dedicated for family, friends and future generations to celebrate the life of their loved one. Sharon was born in Palatine, Illinois, to George and Eleanor Meier and later moved to Scio Oregon where she met and then married William Parker on November 27, 1963. 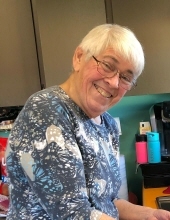 Together they raised three children and she worked for the Scio School District as a custodian and was active in the community. Sharon later moved to Klamath Falls, Oregon, where she resided with her companion Harold Brackensick. Together they loved the outdoors and enjoyed camping and riding ATV’s. She had a wonderful sense of humor and could make anyone laugh or bring a smile to your face. She was preceded in death by her parents George and Eleanor, her siblings Shirley Hildebrandt, June (Ron) Lott, Thomas (Judy) Meier and her husband William Parker. She is survived by her three children Daniel (Joy) Parker of Scio, Douglas Parker of Klamath Falls, Teresa (Robert) Sandberg of Reno, Nevada, and her three grandchildren Marcus Sandberg, Holly Parker and Nolan Parker. To send flowers or a remembrance gift to the family of Sharon Mathilda Parker, please visit our Tribute Store. "Email Address" would like to share the life celebration of Sharon Mathilda Parker. Click on the "link" to go to share a favorite memory or leave a condolence message for the family.